A portent of doom for the people of Cyrodill. For the Hero of Kvatch, LOOT! There's a door ahead. Based on its appearance or its context — usually standing there with no actual wall around it — you just know something amazing and dangerous lies on the other side. This isn't just a physical trope of a door being there, but a narrative device. Because the door is so obviously doomful, the characters recognize that going through is a big decision. Compare Cool Gate, The Lonely Door, Portal Door. Not to be confused with Doom Doors. Often a Point of No Return in video games. The Gate of Truth in Fullmetal Alchemist. In Memento Vivere, a Final Fantasy X fanfiction, Rikkus attempts to enter the Chambers of the Fayth turn them into this trope. In Robb Returns, the Hightowers have a giant dark gate hidden beneath the Hightower that they have been guarding ever since the age of the First Men, that afflicts anyone who gets near with immense fear, and has started pounding ever since magic returned. It is theorized that there is some Eldritch Abomination behind it that must be locked away - and later interactions theorize it to be the Drowned God. The door to the maze in Labyrinth. Jurassic Park: John Hammond deliberately invokes this by having the guided tour of the island begin by entering a large, impressive door, but it's more for show than anything. Ian Malcolm: What do they keep back there, King Kong? The entrance to Toontown in Who Framed Roger Rabbit. King Kong (1933): The huge door in the wall surrounding the interior of the island. We get about five minutes worth of this in Andrei Tarkovsky's Stalker, in which the main characters stare at an omnious door, contemplating whether or not they should go in. In Spiral, a frequent recurring motif is a glowing door in the background of Mason's apartment that has something to do with his imaginary murders. The archway in the Ministry of Magic in the Harry Potter and the Order of the Phoenix. The result of going through is implied to be Cessation of Existence. The three Doors in The Drawing of the Three, the second book of Stephen King's The Dark Tower epic. As in the trope description, the doors themselves appear quite normal; it's the fact that they're standing in the middle of a beach with no walls attached or any visible means of support, and that they appear to vanish when one walks around to view them from the back, that marks them out as magical. In House of Leaves, the door that appears in Navidson's house after the family comes back from vacation, which wasn't there before. The door in Dante's Inferno, with its famous (and much referenced and parodied) inscription "Abandon all hope, ye who enter here." Parodied in Eric, where the inscription has been crossed out in favor of "You Don't Have To Be Damned To Work Here, But It Helps!!!" In Therin Knite's Echoes (the first book), Adem is walking down a hallway full of closed doors he needs to open in order to find the antagonist Brennian. He belatedly realizes that since he's in a dream, anything could be hiding behind the doors. The Doors of Durin (west gate of Moria) in The Lord of the Rings. As is the Dimholdt on the Paths of the Dead, especially in the film version. "The way is shut. It was made by those who are Dead, and the Dead keep it. The way is shut." Subverted in The Princess Bride (the book), where the actual danger lies on the door itself. The entrance to the Temple of Doom in Temple was the Incan version: a giant rock blocking a passageway, with very detailed pictures of people dying all around it. When the miners of Galaxy of Fear: Spore Dug Too Deep into an asteroid, they found a monstrously thick door with a terrified-looking statue outside of it. There had been more nuanced warnings there too, but those had been scraped away. Carl Sandburg "Rootabaga Stories" has a chapter "Four Stories about the Deep Doom of Dark Doorways" but being a children book, no Doom whatsoever can be found. Probably just the Doomy Dooms of Doom syndrome at work. The appropriately-named Gates of Doom in Indiana Jones Adventure at the Disney Theme Parks appears to be a portal to a nightmarish alternate dimension. Possibly the final door leading to Tabuu in Super Smash Bros. Brawl, being a gigantic glowing door leading to the final boss that requires you to defeat every opponent you've ever faced to pass through it. Both played straight and subverted in the Kingdom Hearts series. The door that leads to the first boss in Silent Hill 3. The red boss door in Yoshi's Island. Bonus for being twice the size for the Final Boss. Super Mario World did it first: Haunted Houses, Castles, and Boss Rooms all have some sort of doomy door. Not to mention the Thousand-Year Door. The earth all around it cracks when it opens! The New Super Mario Bros. series usually have these to signal boss fights. Bowser's fights are usually preceded by an even more menacing door. The door leading to the Fugue plane in Neverwinter Nights 2: Mask of the Betrayer. The Elder Scrolls IV: Oblivion has Oblivion Gates to the eponymous realm. They are big burning arches that scorch the area around them, turn the sky above them red and ominous, and cause plants from Oblivion also grow around them too. Essentially, what is on the other side leaks over. Which is a barren wasteland of blackened islands in a sea of lava. 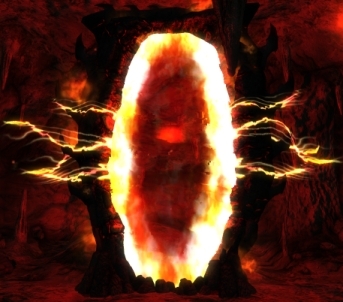 The Dimensional Gateways in the Warcraft setting are these. The prime example is the Dark Portal that leads to Outland, a world that had so many of these gates opened that they tore the world apart and sent what was left into the Twisting Nether. God of War has three main flavours of door: large, very very large, and "yeah, definitely a boss here" large. (Or, from a god's point of view, miniature, small, and medium). Mass Effect 2 has the Omega-4 Relay, which is coloured red as opposed to the usual blue of the Mass Relays, almost like a warning, which is suitable, because ships that enter it never return. The map just before the Final Boss of Half-Life has an unsettling alien teleporter in an area that's completely black. The portal glows red instead of the usual green teleporters, and it somehow replays voices from the beginning of the game. Freeman's Mind paints it as resembling the cover to a metal album. Diablo has this in spades. Lets you go to hell with horrors at the other end. The door to Ultimecia's throne room at the end of Final Fantasy VIII is a red double-door with skull figurines above it and an all around creepy feel to it. Plus there's a Save Point in front of it. Touching this door gives you the chance to back off or open it, the latter of which starts the four-stage Final Boss fight of the game. The door that leads to the Dead God's Pad in The World Ends with You. Shiki lampshades this trope by saying "This door just screams 'endgame.'" The third Charlie the Unicorn flash has one of these. Er...sort of. It turns out that the door is not as fantastic and mysterious as advertised. The sequel to the NES Godzilla Creepypasta has a large gate that appears between stages, with seven empty slots that are gradually filled each time Carl defeats a boss. Presumably, it will open when all seven have been beaten. Futurama has a Show Within a Show that uses this: The Scary Door. In The Real Ghostbusters episode "Knock, Knock", a literal Door of Doom is featured. "Do not open until doomsday!" Danger Mouse: "Penfold, the Door of Doom has just fallen on us." Danger Mouse: "Then why are you giggling?" Penfold: "Because Chief... You've just become a dormouse!" The painting That Which I Should Have Done I Did Not Do (also called The Door) is one of these. Subverted in that it represents a wasted life - not going through it was the wrong choice.